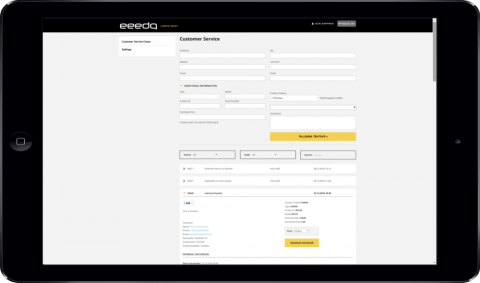 The eeedo customer service management software is suitable for call center companies as well as for in-house customer service teams. Our customer service system helps you to manage customer service ticketing and ensures that support requests will always be answered by the right person. It is 6 to 7 times more expensive to acquire new customer than retain your current one. eeedo customer service solution helps you to provide the best possible customer experience. Our solution works as an easy to use task/ticket management solution for back-office customer service agents. When additional input to solve the case is needed from other employees, we create a trackable task for that person. The question can be forwarded via email, bi-directional SMS or mobile app. The person whom this task is delegated can reply directly to the email or SMS, and the customer service agent will receive the answer to the system. To provide omnichannel customer service you need to be there where your customers are. Typically, businesses hear from only 4% of dissatisfied customers. Luckily social media has lowered the bar of contacting companies. Our solution allows you to answer customer inquiries on Facebook, Twitter, YouTube, and more. 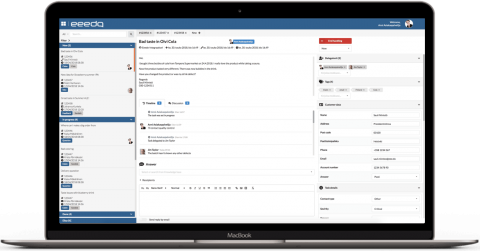 Our platform can be integrated with your current CRM, customer loyalty software, email and call center software (e.g. Centile ISTRA). 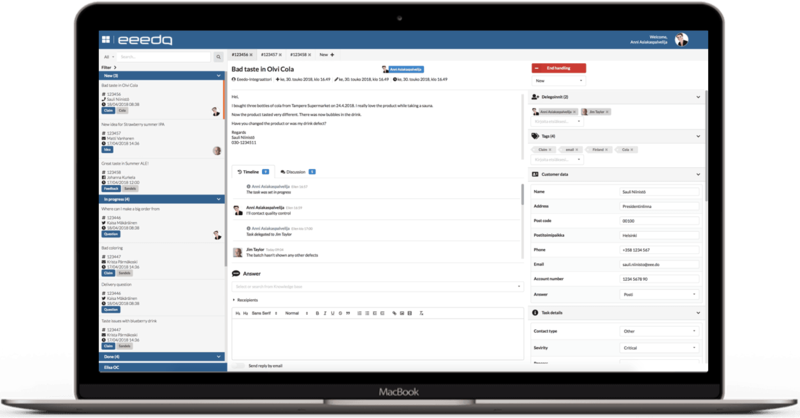 This allows your customer service agents to have one dashboard view for all relevant customer information to provide top-notch customer service. Our customer service software comes with a built-in answer templates for your most asked questions. This makes your customer service agents’ job easier and saves time. Your agents can personalize every reply before sending and discuss cases internally before answering the customer. Did you know that 91% of unhappy customers will not willingly do business with you again? Contact us and we will help you to keep your customers happy! Answering inquiries and questions is easy with the eeedo customer service system. You can research the answers to inquiries by clicking the tags in the tag cloud, by using the search features, or by using the directory to contact the people who have the answers. When you are ready to respond, the service also allows you to handle email requests directly through the system for faster replies. These faster, more accurate responses through eeedo will result in a better customer service experience and happier customers. Streamlined customer service process tailored to your needs. People directory that can be searched by specific skill, location, department or a combination of these. 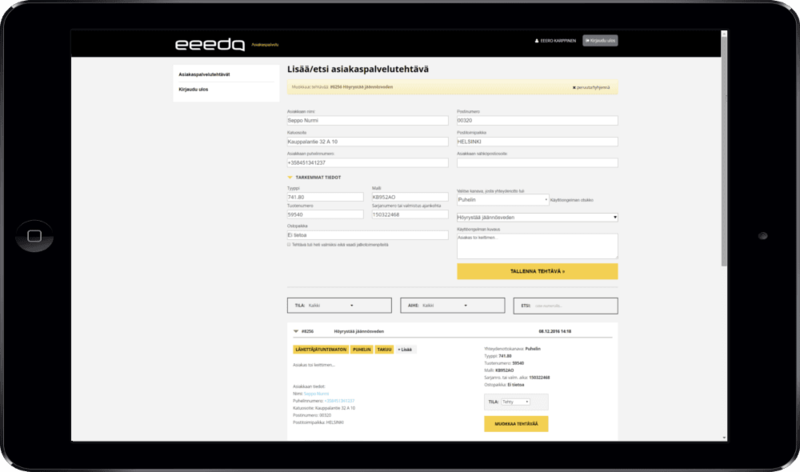 E-mail, website form and social media requests through the system. Integrations to call center software (For example, Elisa Ring and Centile Istra). Statistics to help you improve your customer experience. 80% of companies say they deliver superior customer service, but 8% of people think these same companies deliver superior customer service. Don’t be that guy! With our help, you have a better chance to be in that 8% group who keep their customers happy.